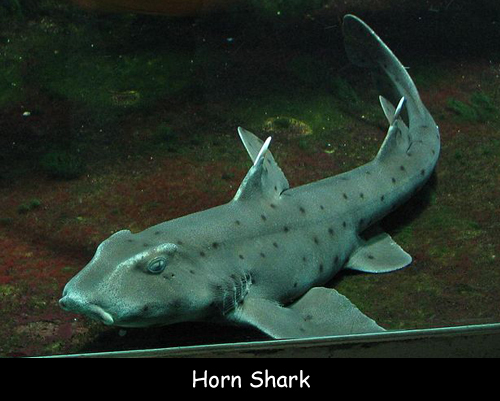 The Horn Shark belongs to the bullhead shark family. This species is commonly found in the warm coastal waters off of north-east Pacific Ocean. This species got its name because of its short blunt head which is almost horn-like in appearance with high ridges above the eyes. The scientific name of the Horn shark is Heterodontus Francisci. These sharks have brown or grey skin covered with many small dark spots. It has two high dorsal fins with large spines. On an average, adult individuals measure about 1 meter. Horn Shark belongs to order Heterodontiformes, family Heterodontidae and genus Heterodontus. The diet of Horn Shark consists of hard-shelled mollusks and crustaceans along with fish, squid, octopus, sea urchin and sea star. The mating season of these sharks takes place between the months of December and January. It is the only shark species to display pre-natal care, as she collects her eggs in her mouth before depositing them to a safe place. The incubation period of the eggs lasts around 6 to 10 months, depending on temperature. Their average lifespan ranges from 12 to 25 years in captivity. They use their flexible, muscular pectoral fins to push itself along the bottom of the ocean rather than swimming. These sharks become active during the night and remain hidden in caves, crevices of rocks and thick beds of algae during the day. This shark has a powerful bite that facilitates opening of hard shells. Declan, Tobin. " Fun Facts for Kids about Horn Sharks ." Easy Science for Kids, Apr 2019. Web. 21 Apr 2019. < https://easyscienceforkids.com/horn-shark/ >.